Welcome to Harmony Specialty Dairy Foods! Artisan Cheese, Kosher Cheese and much more! We fill a vat with ten thousand pounds of pasteurized fresh milk from Harmony-Ho Dairy Farm and bring it to 90 degrees F. Our Cheesemaker watches it very closely and tests it periodically until it reaches exactly the right temperature. He then adds starter cultures to the milk causing it to being turning into cheese. When ready, the curd is cut with the cheese knives as they are doing on the left picture. The knives consist of stainless steel wire set 3/8 of an inch apart. The knives are run from one end of the vat to the other, turned, and then run back. 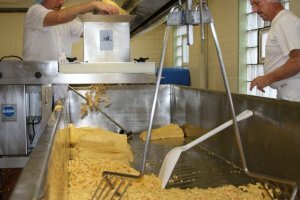 This ensures both a horizontal as well as a vertical cut so the cheese will form in curds. You can see the curds beginning to form in the picture at the right. As the curds form, whey is the byproduct and is the thinner fluid you can see in the picture. The milk remains in this state for approximately one hour. 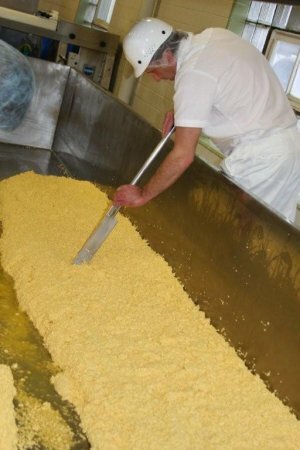 Once the consistency is correct, the whey is begun to be drawn out of the vat, leaving more of the curd to be viewed. The curds continue to harden as the whey is drawn off. The whey is placed in whey tanks and further processed into whey protein fractions. 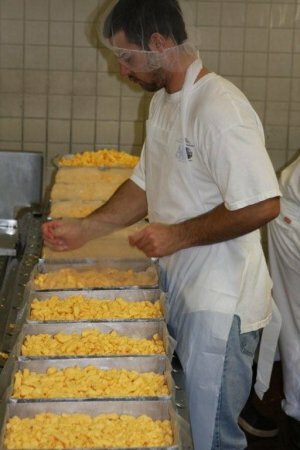 The curds are constantly turned with plastic and/or stainless steel shovels so they are the same consistency throughout. This also prevents them from sticking together and forming 'lumps' of cheese. 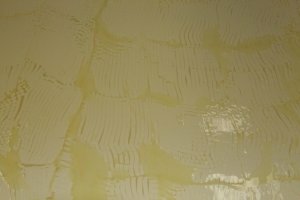 As more and more whey is drawn off the vat, you begin to see the bottom. We then move the curds to both sides of the vat to allow the whey to drain down the center. The mats of cheese are flipped occasionaly so the texture is the same on both sides. This is also called 'cheddaring'. 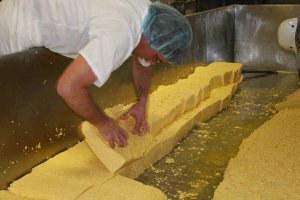 At the proper time the slabs of matted curd are run through a curd mill to create a rectangular shaped curd suitable for hooping. Once the whey is all drawn off, forks are added to the automatic mixers above the vats. 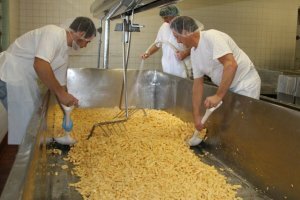 They go down the vat from one end to the other, stirring and churning the cheese to ensure it remains the same all the way through and groups of curds do not get compressed together. The forks also stir in salt that is added to the curd. While the forks are churning, we use large stainless steel hand forks to ensure no curds get 'stuck' at the edges and ends of the vat. Lastly, we place the curds in stainless steel hoops. The hoops are 'dressed' with a cheesecloth that allows the whey and moisture that is still in the curds to be squeezed out. We put a cover on the hoop once full and place it in a press. We press the hoops for several hours and then we have 40 pound blocks of cheese ready for aging and sale.